You’ve probably heard of BOTOX® Cosmetic and Dysport®, but perhaps you have not met the new kid on the wrinkle-prevention block – XEOMIN®. XEOMIN® is a purer form of botulinum neuromodulator, and thus there are reduced chances for allergic reaction and rejection by the immune system. In fact, it can be a good alternative to both Botox and Dysport as Xeomin contains no accessory proteins which means that patients are less likely to develop antibodies to the product. Xeomin (incobotulinumtoxinA) for injection, for intramuscular use, is a prescription medication used to temporarily improve the appearance of moderate to severe frown lines between the eyebrows (glabellar lines) in adults. Xeomin contains botulinum toxin type A, a protein purified from the bacterium Clostridium botulinum. When you squint or frown, the muscles between your brows contract, causing the skin to furrow and fold. Over time, as your skin ages and loses some fo its elasticity, these repeated contractions canc ause persistent frown lines. Botulinum toxin type A – the active ingredient in Xeomin – acts on nerve endings in muscles to prevent muscle fibers from contracting. By reducing these contractions, it can temporarily reduce the lines on your forehead between your brows. If you are an adult with moderate to sever glabellar lines, Xeomin may be right for you. Talk to your doctor to discuss the benefits and risks of treatment. Do not take Xeomin if you are allergic to botulinum toxin or any of the other ingredients. You should also not take Xeomin if you have had an allergic reaction to any other botulinum toxin product or have a skin infection at the planned injection site. Typical results last 3 to 4 months. If you have been troubled by wrinkles between your brows, Xeomin might be the perfect choice for you. 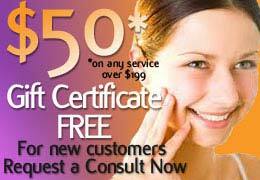 Consultations are always free so set up your appointment by contacting us today.